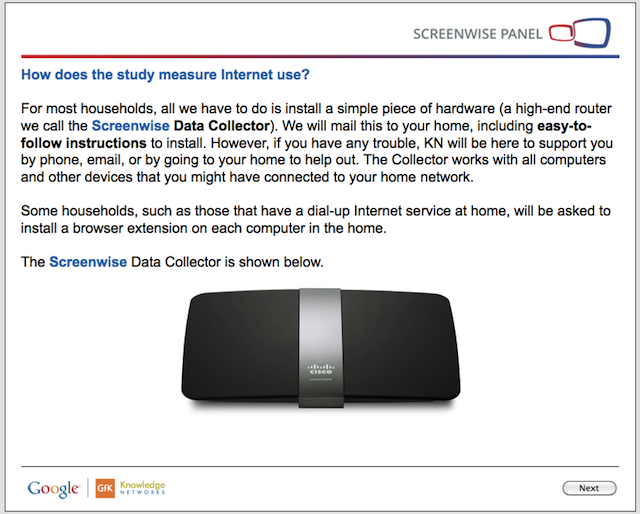 Google has "quietly" launched a new project called Google Screenwise, which is part of the Google Knowledge Networks program. Google will pay you $25 for them to track your every move online. And you thought Google was tracking your every move on the internet already. But no, they want more. Google says this will make the internet better plus you get "up to $25 in gift cards." Like many other web and media companies, we do panel research to help better serve our users by learning more about people's media use, on the web and elsewhere. This panel is one such small project that started near the beginning of the year. Of course, this is completely optional to join. People can choose to participate if it's of interest (or if the gift appeals) and everyone who does participate has complete transparency and control over what Internet use is being included in the panel. People can stay on the panel as long as they’d like, or leave at any time. The folks at WebmasterWorld are insulted that Google is doing this for a few reason. (1) The pay is way too low. (2) The information they collect with this is overboard. (3) Isn't Google tracking everyone anyway?